Named after Walter Jenkinson, manager of E.I.D. at the time of the reservoir building in 1959, this recreation area offers many amenities. Separate horse and hiking trails circle the entire lake. At the far end you can follow Hazel Creek a short ways to a nice waterfall and continue around past some old chimneys and visit the small Indian museum. 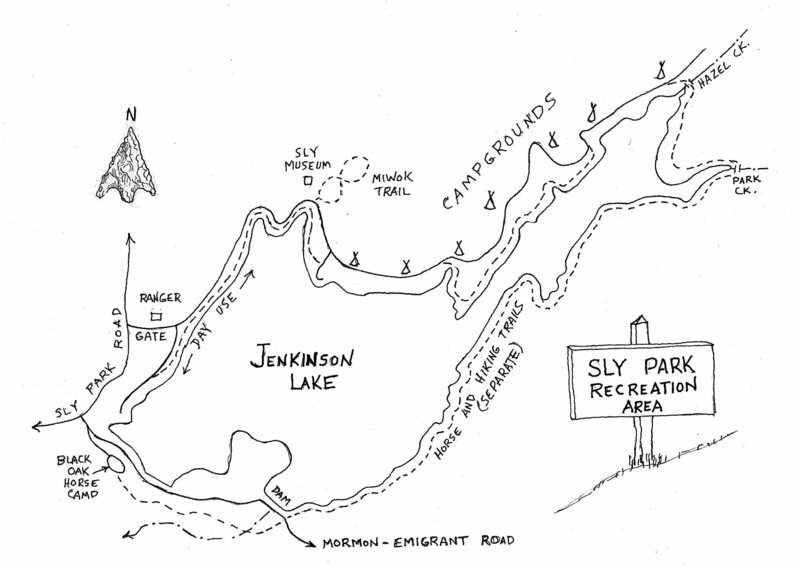 Directions: Go 13.5 miles east of Placerville on Highway 50 and take exit 60, Sly Park Rd. to the R, Go 5 miles to the entrance station where a $5 fee gets access to the parking areas. Or, find a free place to park near the dam to access the trails. The trail goes all the way around the lake crossing the two main creeks that feed the reservoir on wooden bridges. Walking is easy, bike riding more technical and challenging along the east end, easier along the north campground side roads. Horses can stage at the Black Oak Equestrian staging area found just south of the intersection of Sly Park and Mormon Emigrant Roads. History: Along the north shore of the present reservoir during low water times hundreds of Bed Rock Mortars can be found near the Arrowhead Campground. This place was an important meeting place during the Fall acorn gathering season where Maidu and Miwok Indians gathered for trading and processing of the acorns. Check out the nearby museum for more information.